Klingons are one of the best-known alien species on TV, having been recurrent figures on many Star Trek series and movies. 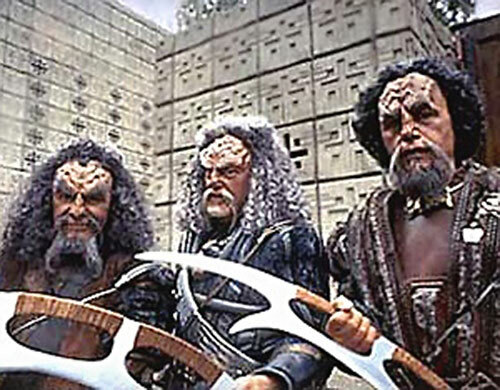 This article offers a compact primer to Klingons as they appeared in XXth century Trek series, plus game stats. Plus one of our made-up DCU History sections because heh, why not. Height: 6’2” Weight: 215 lbs. Klingons are a very tough race. 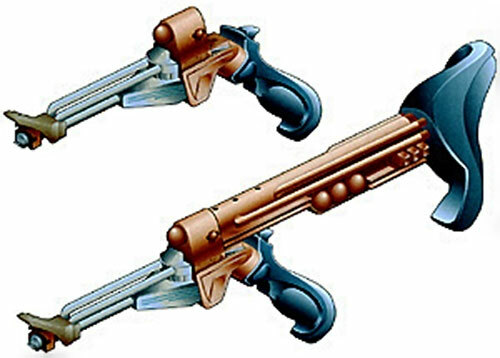 Most Klingons are skilled with hand-held weapons, and also use disruptors and the like. A Klingon Warrior is very bold, always ready to fight, and hold honor above all else, even life. The Klingon body features redundant organs, possessing what the Klingons call the brak’lul. They have two livers, an 8-chambered heart, three lungs and 23 ribs. 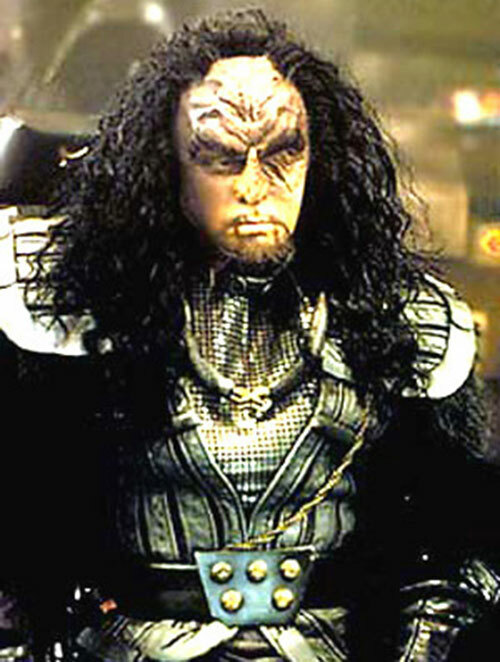 Current Klingon culture was shaped by a warlord named Kahless the Unforgettable. That was 1,500 years before the era of the Dominion War (the 9th Century AD). Kahless’s primary contribution was a code of honor emphasizing one’s ability as a warrior. This ethos became dominant in Klingon culture. This warrior code led to a policy of imperialistic expansion. 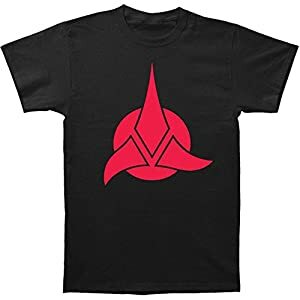 It was eventually halted when the Klingon Empire’s borders met equally-powerful societies such as the United Federation of Planets, the Romulan Star Empire, and the Cardassian Union. These groups have settled into an uneasy detente punctuated by occasional conflicts ranging from border skirmishes to brief full-scale wars. 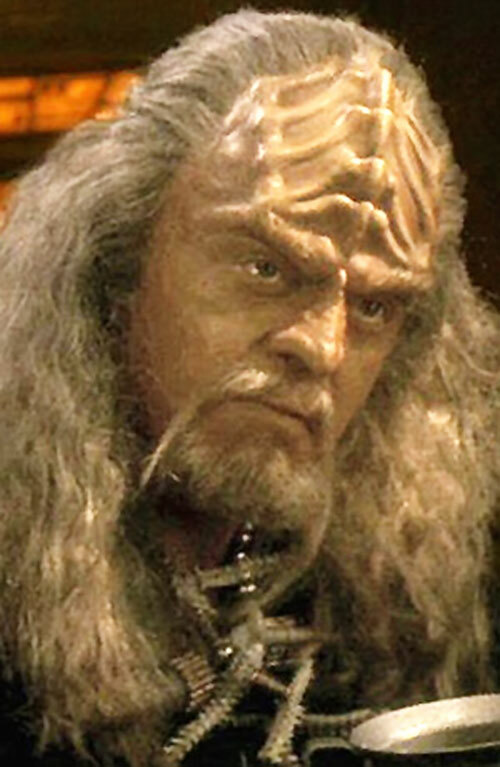 There was a historical discontinuity in the physiognomy of the Klingons due to genetic experimentation. In the 22nd Century, Klingon scientists acquired DNA samples from “Augments”. These were Humans who had been genetically engineered for greater strength and intelligence. Attempts to use this augmented DNA on Klingons failed. The augmented Klingons eventually suffered fatal defects. The experiments also resulted in a virus that disfigured Klingons, smoothing their cranial ridges and making them look more like human beings. This virus was eventually cured but it left many Klingons with altered appearances. 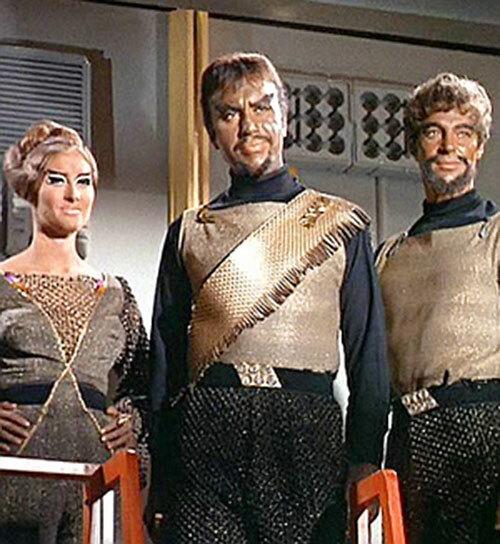 As a result, most of the Klingons encountered between then and the 23rd Century looked almost completely Human. Through unknown means (possibly including medical advances and cosmetic surgery) the virus’s effects were eventually overcome and all Klingons now bear the distinctive cranial ridges. That includes those Klingons who previously appeared Hhuman. 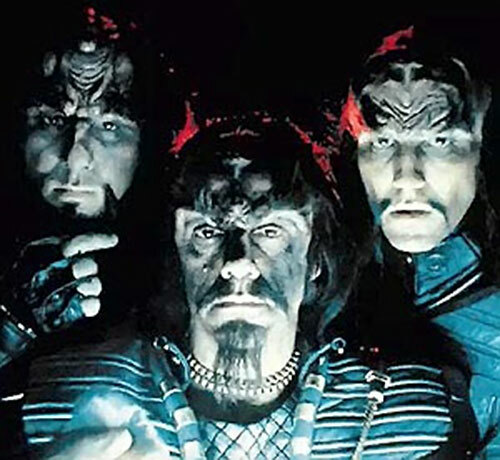 Recent events have blunted the Klingons’ expansionist ways, due primarily to more tempered leaders who have come to respect the other groups they previously considered rivals and who have recognized the deleterious effects that reckless aggression has had on the Klingon Empire. Brash, bold, loud. Quick to anger, love battle. A very proud race. Honor and courage are everything. Yell a lot and chug bloodwine. Think of the type of guys who would kill their own Gods (they were apparently more trouble then they were worth). 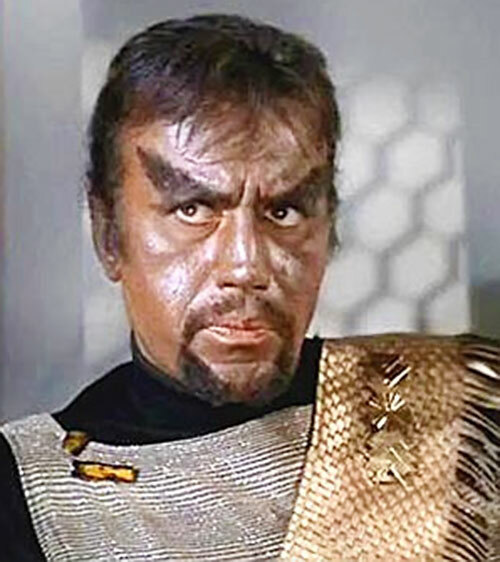 Klingons were once the “evil in us,” being slimy, back-stabbing Humans with bad makeup and a vaguely Russian or Communist background. They later became stereotypical faux-Viking warriors with funky skin conditions. 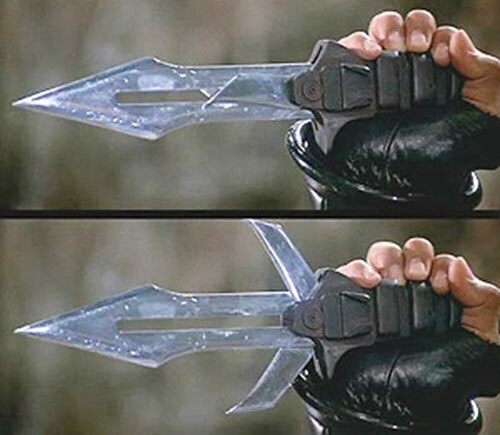 It should be noted that not all Klingon warriors actually subscribe to the code of honor. But even those who do not will do their utmost to appear to abide by it for the sake of not getting killed by their fellow warriors. Big guys with brown skin, long hair, big beards and ridged foreheads. Those that were exposed to the Augment virus have smooth, human-like foreheads and slightly more pink skin tones. A L.E.G.I.O.N. team tries to get them to sign up for membership and releases the Klingons onto an unsuspecting galaxy (imagine Lobo versus Worf). For a LSH campaign, an interesting variation could be seeing 30th Century Klingons. Have they mellowed ? Are they even around or have they killed themselves off in “glorious battle” ? Or they could be smooshed in with the Khunds, since they’re all but the same race, anyway, half the time. They participated in Invasion! after encountering some STAR Labs or LexCorp experimental flyer, fought Earth’s colonies through the XXIIIrd century, allied with them through the XIVth, and became hated enemies again by the XXXth. There is precedent for this in Trek. As my friend Corey once said, “are we at war with the Klingons in every alternate future ?”. One could consider the possibility that old Klingons, new Klingons and Khunds are all somewhat related races from the Klingon Empire. After all, the Khunds’ warrior ethos was a result of being conquered by the Dominion and pressed into service as the Dominion’s armed forces, eventually throwing off the Dominion’s yoke and becoming an independent power. Maybe Kahless was a Khund who drafted the Klingons in a manner similar to that by which the Dominators drafted the Khunds. The battle to free themselves from the Dominion may be reflected in the Klingon myths about killing their gods. The Augment virus could be replaced with something developed as part of an alliance with the Dominators, trying to crack the metagene and unleashing a genetic virus instead. M/SIA to Obeying Code of Honor (including an irrational preference toward melee combat), SIF Tribbles, SIH Romulans, M/S Rage. WARRIOR’s ARMOR [/BODY/ 04, Partial Armor (+3 CS Trick Shot to bypass)]. D’k Tahg Knife [BODY 06, EV 03 (04 w/STR, 05 w/Martial artist)]. 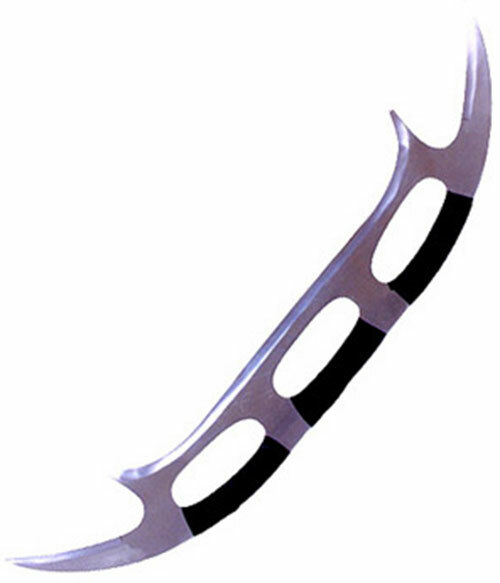 Bat’leth [BODY 06, EV 04 (05 w/Martial artist), Bonus: Block attempts gain a -1 CS to the OV due to the Bat’leth’s design]. 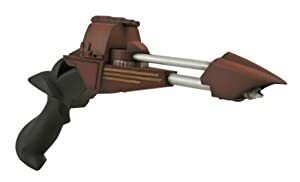 Klingon Disruptor Pistol [BODY 05, Energy Blast: 08, Disintegration: 12, R#2. Bonuses & Limitations: Disintegration has a minimum EV of 9; Energy Blast is non-lethal only]. 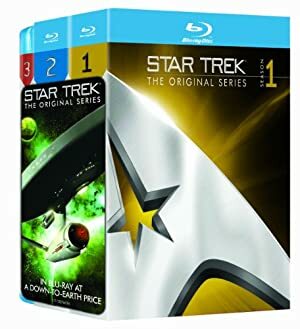 Source of Character: Star Trek Universe. Helper(s): Brian Patrick Young, Sébastien Andrivet, John Colagioia, Roy Cowan.